You all know I love to Up-cycle stuff, right? My Hand Knit Rag Rug was a huge hit, and a lot of fun! And who could forget our Juice Jug Greenhouses? 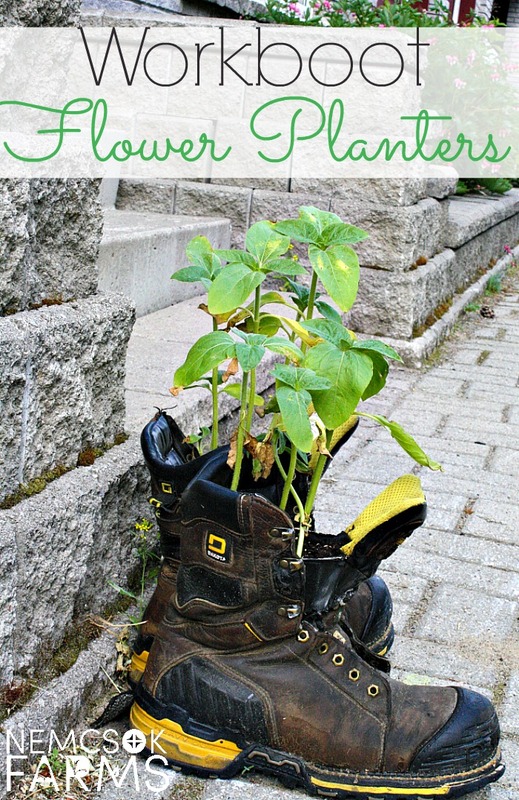 Anyway, my very kind and understanding husband also realizes my need to keep stuff, and was very pleased to offer me his old work boots…so I could plant flowers in them. And I did. This Bird Cage Planter – by Crafts by Amanda is really just too pretty. It would look lovely on any corner of a deck, the center of any harvest table, and would be especially lovely as a hanging planter. 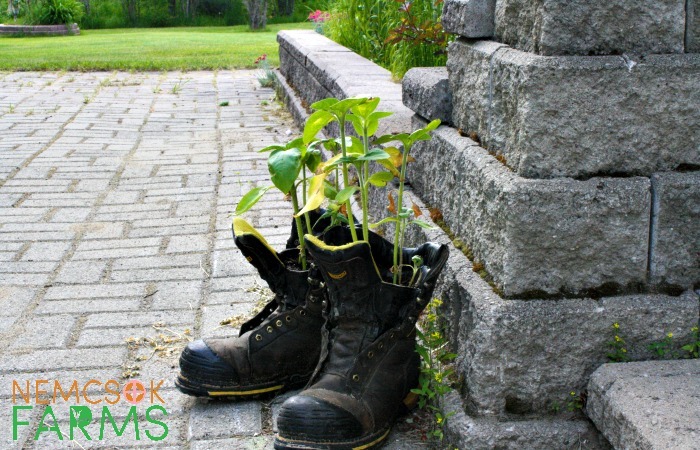 A Rain Boot Planter – by A Cultivated Nest is simply adorable, and would make a lovely addition to any front porch! Great idea for a Grandma and Grandpa gift, if made with little boots. Talk about cute. I found some awesome haning planters! These Bird Feeder Planters – by Petticoat Junktion, brilliant Fishbowl Planters – by A Beautiful Mess and really clever Rain Gutter Planters – by Restoration Redoux are all really smart up-cycles! I love this nifty Mailbox Planter – by Garden Chick, and my front yard absolutely needs a Chair Planter – by Between Naps on the Porch. These are too easy, really. The hardest part may be finding a pair of boots you’re willing to part with. Fill the rest of the boot with potting soil. I told you it was too easy. Which ones will you try? 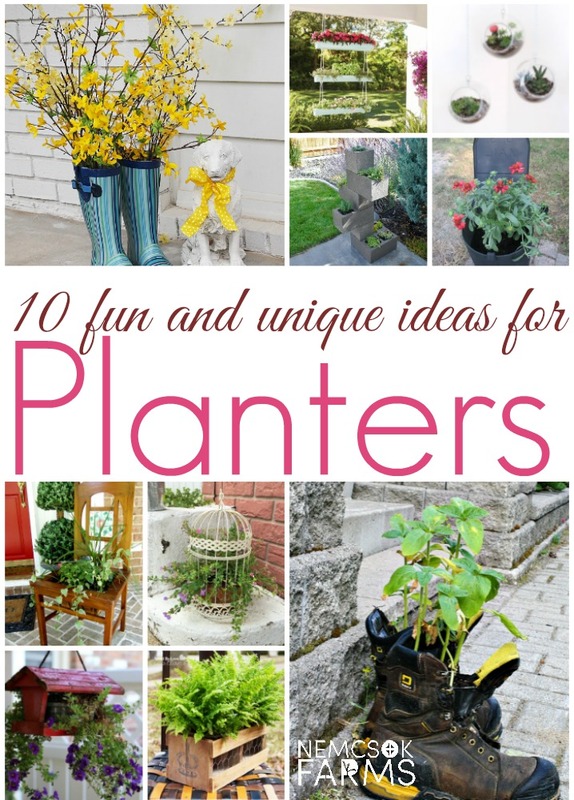 Check this out for even more great garden decor ideas!